Home Bootstrap Bootstrap 4 Admin Templates: How It Will Save Your Development Time? With the advancement of technology, the world has changed for the better. With the development of devices compatible with multiple platforms, there is an immediate need for websites to adapt to the dynamically developing landscape of the web. The interface of a website has to be fully responsive as well as easy to navigate because if not, businesses can risk losing a large portion of their clientele. If you want your business to maintain anefficient and useful online presence then Bootstrap has to be your ultimate choice. There are many templates that provide an extremely professional and fully functional design. 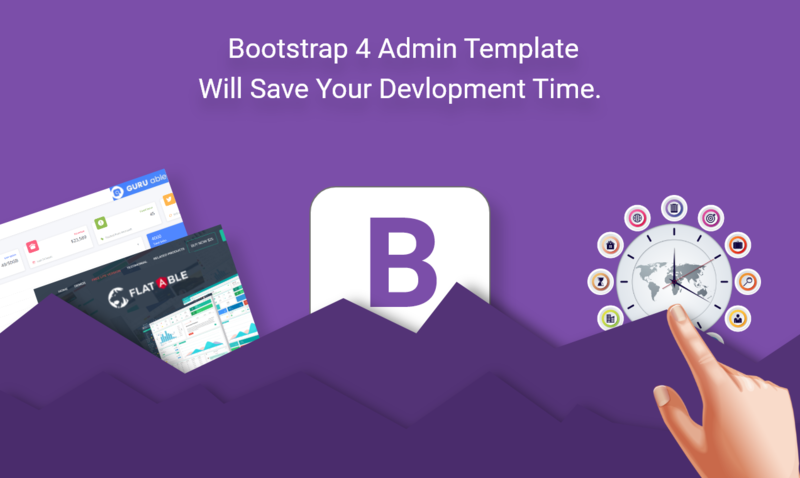 Let us take a look at following Bootstrap 4 admin templates and how they have the potential to save up a lot of development time. Able pro 7.0 Responsive Bootstrap 4 Admin Template is an ideal choice if you are looking forward to saving time devoted to development. It is one of the most trending themes for admin and comes with the latest technology. There are detailed change logs and a provision of regular updates. Some of the striking features are 100+ plugins, 150+ plugins, 1200+ components for UI, a wide variety of menu designs, options for new layouts, and 200 pages included. The Bracket Plus Bootstrap 4 Admin template has been designed keeping in mind the needs of both large-scale as well as small-scale activities. The design is up to date and has been made using high standards. With useful features and excellent functionality, this theme ensures a top-notch performance and a flawless experience. A clean and systematic look is one of the most attractive features of a theme and this is what is the central focus of this theme. The users are provided with an interface they can easily understand and everything is well-organized. Bracket Plus is a powerful theme owing to its predesigned demos and range sliders. With a future-oriented approach and an ideal performance, Espire takes an edge over most other templates in terms of the efficiency of performance and its long-term usability. The pliable design ensures that the theme is extremely useful. Another great thing about this template is its adaptability to different platforms and compatibility with various designs. The number of mobile users is on the rise each day. With this, the requirement of a template that can work with almost all devices in a hassle-free manner is a must. It supports both HTML5 and Angular and versions. Even though the theme offers a wide array of features some important ones include a clean design and simple coding designed to cater to all your needs, RTL switches, light themes, and dark themes. Espire has an interface that can be successfully integrated with various devices. Every user is after a template that offers the complete solution to their issues and fulfills all the needs. If you are looking for a plethora of predesigned content for dashboard templates then Monster has to be your one-stop destination. Some of the features include five dashboards, 500 UI elements, six demos, 700 pages, and a total of 12 color schemes. Every business plans a time during which they are supposed to achieve their goals. If you opt for Monster, you will achieve your target way before you planned without investing a large span of time in finalizing the product. These themes that are equipped with the latest technology and frequent automatic updates. The front end capabilities of our themes are unmatched. Thus, these bootstrap 4 Admin templates help you to save a lot of time that is spent on web development and enable you to invest in other activities that contribute to the overall development of your business. The cost and time that has to be devoted to the development of a website are extremely high. In order to save up the costs and precious time, it is a wise move to opt for Bootstrap 4 Admin Templates. It gives you an opportunity to invest your money and efforts in other activities that contribute to the progress of your business. If you have any question please let me know in the comments section.